(From Wiki) According to police sources, on March 31, 2019, Hussle was shot multiple times in the parking lot of his store, Marathon Clothing, in South Los Angeles at about 3:25 p.m. Hussle was hit five times in the torso and once in the head. Two others were wounded in the shooting. All three victims were transported to a hospital, where Hussle was pronounced dead at 3:55 p.m. He was 33 years old. Upon hearing the news, numerous celebrities offered their condolences on social media. Police have identified 29-year-old Eric Holder as a suspect. Investigators believe Holder was known to the rapper and that the shooting was possibly motivated by a personal matter. 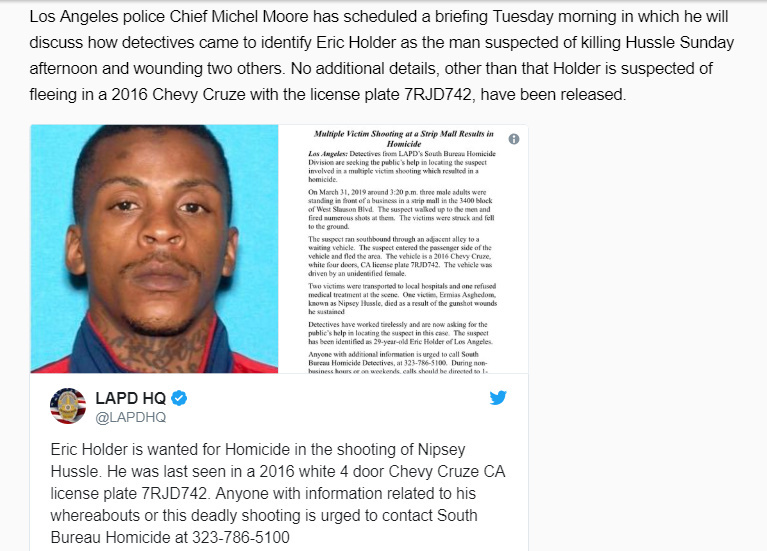 On April 2, 2019, Holder was apprehended by members of the Los Angeles Police Department. [ In the days leading up to his death, Hussle had reached out to officials from the LAPD about having a meeting with him and Roc Nation about what they could do to help prevent gang violence in South Los Angeles. The meeting had been scheduled to take place on Monday, April 1, 2019, but was scuttled due to Hussle’s untimely death Sunday the day before. According to Los Angeles Police Commissioner Steve Soboroff, the meeting will still take place at a yet to be announced date. There is absolutely zero chance that this is not a scripted event/hit. A ritual murder in plain sight. Aside from the over-the-top numerology scripting as laid forth in the official Wikipedia documentation of the events everything surrounding Nipsey points to the fact that he was murdered not unlike Bob Marley, John Lennon, JFK Robert Kennedy etc. Keep in mind that this Event/Ritual spans “3” days in its execution. From the point of the murder to the apprehension of Eric Holder three days . No doubt it will play out in the next few weeks to follow, but the kinetic aspects of the ritual took three days. Born Ermias Joseph Asghedom: Ermias = God will rise, Joseph = May Jehovah give/increase, Asghedom = Unknown. Nipsey’s given name means God will rise and increase. Nipsey Hussle: Nipsey = From Tigrigna literally translates to ‘self’ and as a slang refers to ‘homeboy’ or ‘homie’. 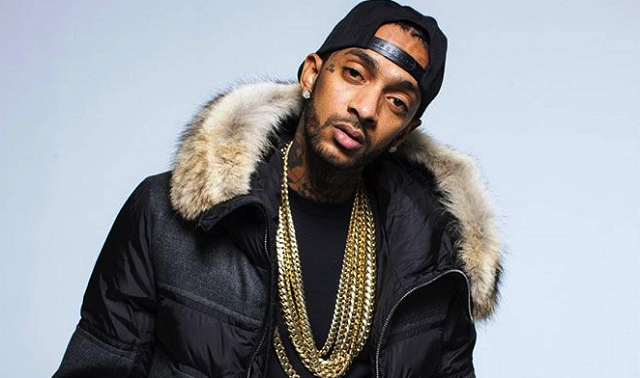 Hussle = ‘To Hussle’ Hence Nipsey’s professional name means “Homeboy hussler“. Lauren London – Nipsey’s “longtime girlfriend” English cognate of the French Laurence, a feminine form of Laurent, which is derived from the Latin Laurentius (man from Laurentum, a town in Latium). London – New Rome. Londinium, a Roman settlement established on the current site of the City of London around ad 43 AD. At the time of the murder they had been together for 5 years. They have a child together whom they named Kross. Notice how the media posted this picture of Holder. 3. Master Mason signature. Eric Holder: Eric = from Old Norse name Eirikr, derived from the elements ei ‘ever, always’ and rikr ‘ruler’. Eric the Red was a 10th-century explorer/Viking. Holder = From the Anglo Saxon name Haldan meaning ‘To guard or to keep’. Eric Holder means “The forever ruler who guards”. Holder’s age is the number of “disobedience and chaos” 29 OR (2+9=11). 11 is one number past God’s number of “perfect divine completeness” Remember Lucifer’s sin? “I will be like the most high.” This is why we see so many 11’s surrounding occultism and these public rituals. Breaking down the description which was pasted EVERYWHERE on April 1st (the heart of the ritual) we discover something quite interesting. OR a CRUCIFIED WHITE GOAT. What can this mean? Was Holder a patsy? We’ll see some numeric similitude with the name OSWALD a little later on. To sum up: The vehicle and license plate used to get away from the scene of the murder was. A CRUCIFIED WHITE GOAT 33/13. From a ritual mechanic standpoint, I can tell you that having a million plus people repeating the make model and license plate of this vehicle out loud, one just enlisted a literal army of emotionally invested oscillating vibrational points in the execution of this sacrifice. This is simply genius. High Preist level sorcery at its finest. What is the “Perfect Sacrifice”? A pure and unblemished offering. White is the color of purity. 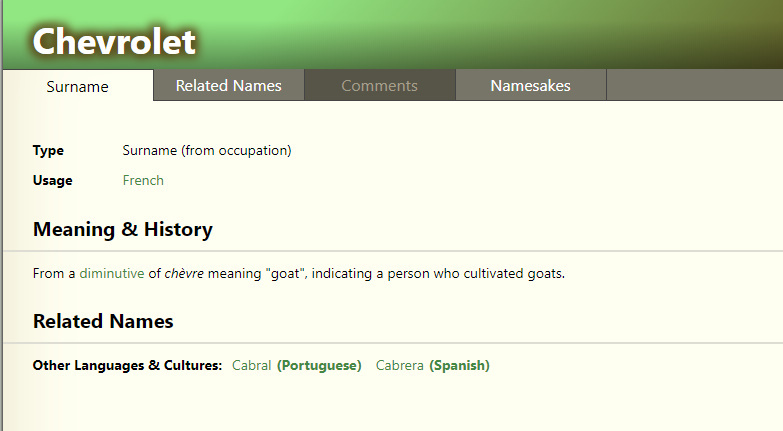 Goats were sacrificed prior to Jesus dying for the sins of man. Jesus offered himself as a perfect sacrifice without blemish to God. For non-Christians out there, this is the ritualistic similitude between the crucifixion of Jesus Christ and his dying for your sins. The Getaway car was the SIGNATURE. Their symbolism will be their undoing. Date – 3-31-2019 = 10 OR Divine Completeness. We see this number used in many public ritual shootings, most famously is the Las Vegas Shooting Ritual. Frame 313 of the Zapruder film shows the moment of impact for the bullet that killed President JFK. The 5th song on the album Infinite by Eminem is called 313. In Twelver Shia Islam mysticism, 313 is the number of soldiers in the army of the 12th “hidden Imam”. Time of Shooting – 3:25 PM. = 10. 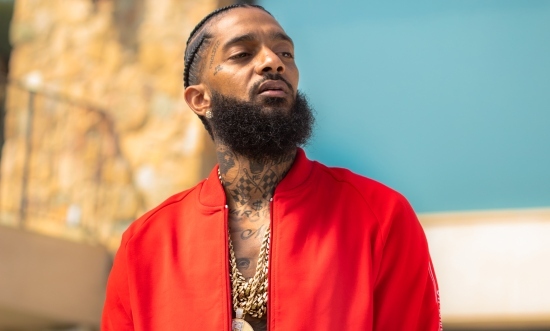 Again, we see the crowning number of ‘Divine Completeness” sealing the murder of Nipsey Hussle. Time of Death – 3:55 pm OR 13. Hour of Day – 3:25 occurred during the 9th hour of the day. The number of infinite potential. Planetary Hour – 9th hour of day on Sunday is ruled by Venus. Ruled by Venus are things such as: Love, joy, beauty, pleasure. Charm, grace, taste, contentment, sensuality. Attraction, partnership. Art, fashion, music, amusements. Valuables, beautiful things, ornamentations, profit. Wife, lover, flirt, courtship, dating. Young women, artists, musicians. Day of Week – Sunday of course. Or the day of SUN WORSHIP and sacrifices made therein. 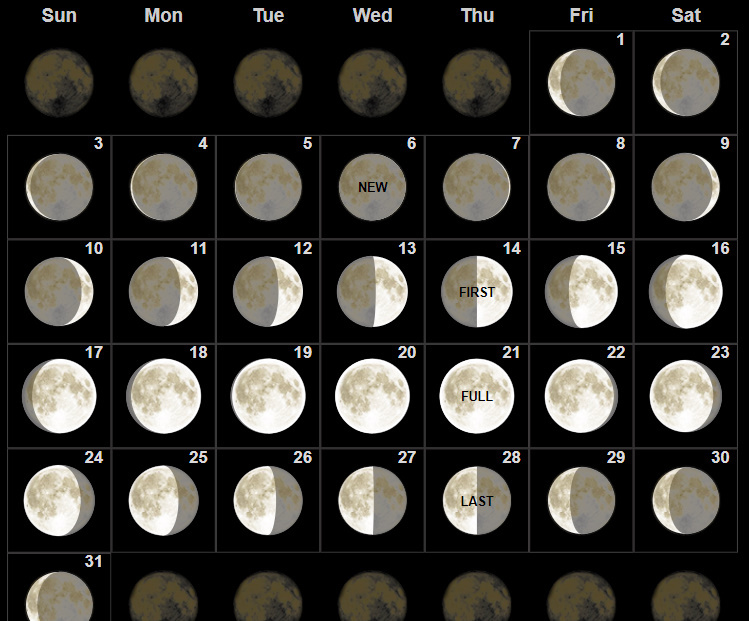 Moon Phase – Waning Crescent: EXACTLY 10 days before after the last full moon. Nipsey was shot and killed at his Marathon Clothing Store – late 19th century: from Marathōn in Greece, the scene of a victory over the Persians in 490 BC; (reduces to 13). The modern race is based on the tradition that a messenger ran from Marathon to Athens (22 miles) with the news. The original account by Herodotus told of the messenger Pheidippides running 150 miles from Athens to Sparta before the battle, seeking help. Nipsey had recently cut an album called “Victory Lap”. Why this theme? We know the sitting events are tied together energetically, emotionally, vibrationally, and symbolically. Of course the first and it comes to mind is the Boston bombing massacre which occurred during a marathon and was without a doubt AN ABSOLUTE HOAX, FALSE FLAG, NWO ORCHESTRATED EVENT. Of all the false flag events this one was the absolute worst. Mind you false flag events were in their infancy at this time and they hadn’t worked out all the proper optics. What is concerning however is that there is a marathon coming up in London on 29 April 2019 this year. Is this a foreshadow? A precursor? Is this an energetic similitude tying the events together energetically? Keep in mind Nipsey Hussle’s girlfriend’s name is Lauren LONDON and that they have a son named KROSS together. Is it so strange that the place of his death was called the MARATHON clothing? We’ve seen 10 above and it is a sealing number. It dominates all beneath it with the vibrational frequency of “Perfect and Divine Completeness” It is used in “hard” locations within ritual work such as time and dates. Nipsey was 33 years old when he died. The Rodney King “Event occured on March 3rd, or 3/3 or 33. I find the plethora of black male deaths surrounding the numerology of Nipsey Hussle extremely uncanny. JFK was shot and killed November 22nd in Dealey Plaza. 11/22 equals 33. Dealey Plaza is also the sight of the first Grand Masons Lodge in Texas. 11, 22, and 33 are known as the Master Numbers. I don’t need to duplicate other researchers work when I can simply steer you to their work. 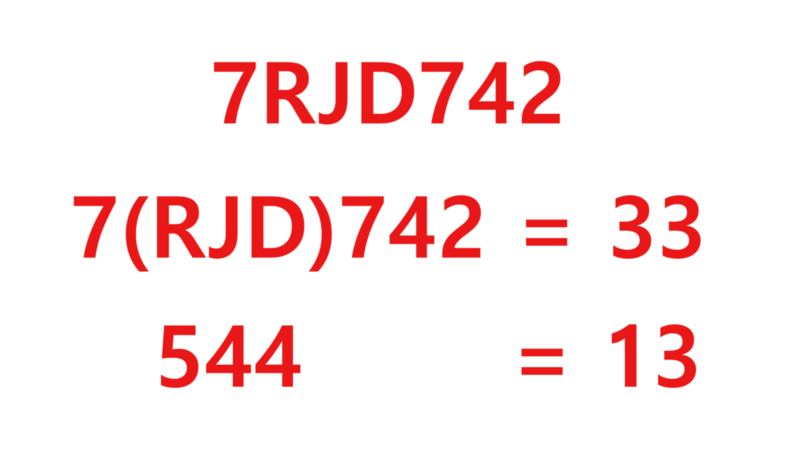 In this case, I’d just like to direct my readers to Gematria Effect News. 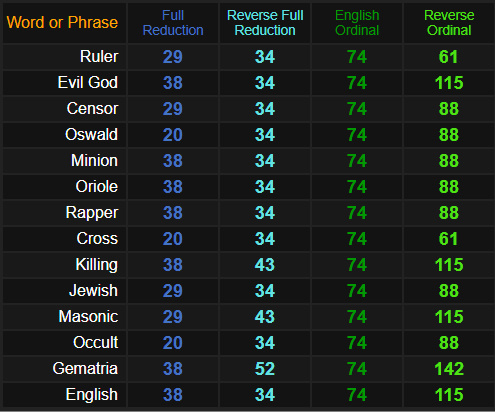 Awesome gematria researcher. Zach and I approach these topics in similar ways but from two different positions of knowledge base and personal history. Try and keep up. Here he covers the #42 in relation to famous black deaths. The final part of Jesus’ earthly ministry is 44 days long. This period began on the day he was crucified, which was Wednesday, April 5 in 30 A.D. (Nisan 14 in the year 3790 according to the Hebrew calendar used in the Bible). It ended on the day he gave his final instructions to his disciples and ascended to heaven from the Mount of Olives, which occurred on Thursday, May 18 (Iyar 27). Nipsey Hussle often spelled his name “Hu$$le” with dollar signs in place of S’s. It doesn’t escape my notice that the $ sign on a keyboard is on the #4 key. This places the number “44” directly in the middle of his name. 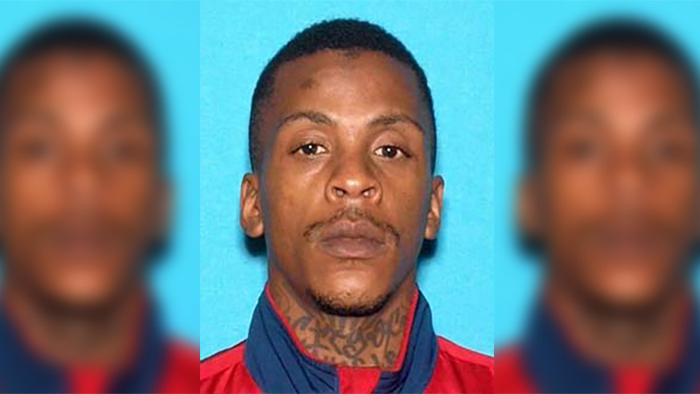 Nipsey’s killer Eric Holder has the same name as Barack Obama’s Attorney General. Obama was the 44th President of the U.S.
MLK was killed on April 4th, OR 4/4 – MLK as we all know was a black civil-rights activist. 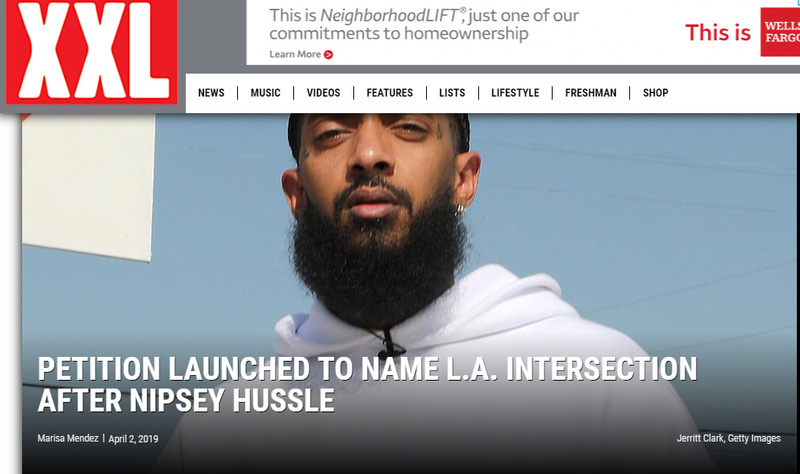 It would appear that Nipsey Russell was beginning to embark on a number of community activist projects including attempting to and gang warfare, nutrition education, and health education specifically about HIV in his community. Malcolm X’s killer Thomas Hagan was imprisoned for 44 years after the murder. Marvin Gaye was killed by his father on his last day of being 44 yo. April 2nd. Feb 13 (2/13) is the 44th day of the year with (321) days left in the year. 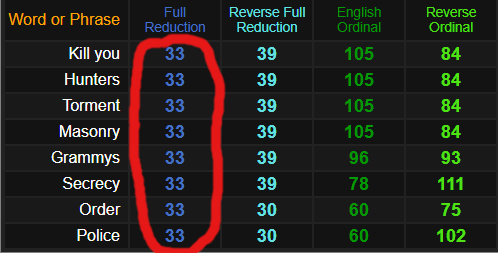 The number 33 can be derived through numerology in both of these numbers. I’m coming to understand that there is an extremely valuable residence to be harvested when tying together these false flag attacks with other orchestrated attacks either in the past or in the future. Here at TPE we decode the numeric aspects of it but in real life, this transference of energy happens through emotion. All of this. ALL OF IT is done for one reason. To elicit an emotional response from the masses which can be harvested, managed and redirected in order to facilitate change according to their will. IE. Gun control, Open Borders, Forced Migration, Forced Diversity, Abortion Mills, Tighter Banking laws, Redistribution of wealth, Censorship, Etc. Nipsey was also slated to make an appearance on DJ Khaled’s upcoming Father of Asahd album. John Legend explained on Twitter Sunday night (March 31) that he had just been shooting the visual with Hussle in Inglewood for a track on Khaled’s upcoming LP, which will be released May 17 which is 47 days after his death. May 17th is the 137th day of the year and 137 is the 33rd Prime number. May 17th is 47 days from the day of Nipsey’s death. 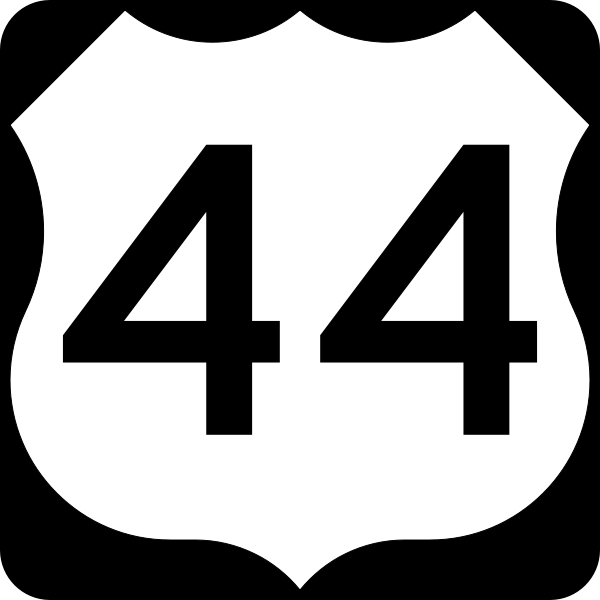 #47 Ritual Mechanics – What may be the energetic principles of the ritual mechanics behind this number? Simple… The compass in the square represents the heavens and the earth. The compass is the instrument in which draw the circle and the square being the instrument from which to draw the square. The circle is embodying of spiritual potential while the square embodies that of tangible earthly energies. Freemasons forever aim to “square up” their lives. The square or the earth is what they operate upon. It is what they must contend with, it is what we all must contend with. The compass, however, is the sacred, the spiritual, the hidden knowledge above. If one combines the two there is literally heaven on earth. There is the existence in the physical realm living with the treasures afforded of the spiritual realm. Take the illustration of the leaves above. 137.5 is the absolute perfect degree at which any plant can extend a new leaf over and over and over as it grows in order to maintain the fullest potential of availability of sunlight exposure. It is this sacred knowledge embedded in the DNA of the plant which lives in a three-dimensional physical world which allows it to live and thrive in perfect balance and harmony. The energies incorporated with illuminati mysticism are much darker however do the opposite. These same principles of ancient knowledge physics and sorcery turned upside down and used to destroy and kill instead. Rodney King supposedly drowned at age 47. Ritual complete/sealed. 74 of course is the MIRROR of 47 and is used in ritual work quite extensively and with great effect. Just take a look at all those words which resonate with the events which took place here. Jesus Christ. Remember…The SUN is the SON in Freemasonry as well as all the ancient mystery schools. This public ritual murder was invoking the energies of the allegory of Jesus Christ or more directly Jesus Christ’s sacrifice for the world. 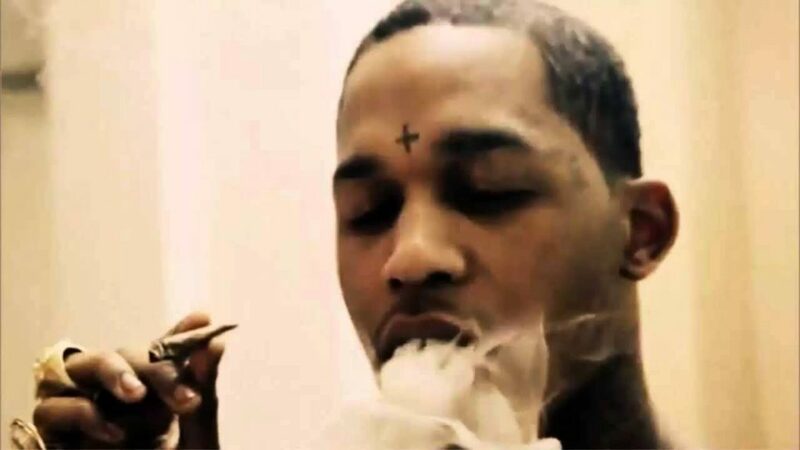 Notice the numbers of black rappers with tattoos of crosses on their faces? 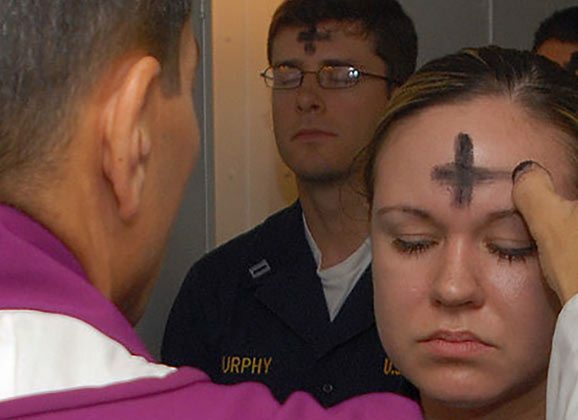 They are being MARKED FOR SACRIFICE!!! Remember even Nipsey’s son was named KROSS. Why? Did he choose the name? Could London be the link? 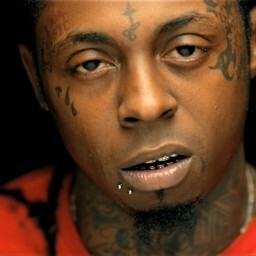 Remember she has a child with Lil’ Wayne as well (pictured above) and is marked for sacrifice. On the day of Nipsey’s murder in the time of Christ, March 31st this happened. Jesus, as he travels during the morning back to Jerusalem, becomes hungry. He spots a fig tree and goes to it hoping to find figs. Finding only leaves he says to the tree “Let no one eat fruit from you ever again” (Mark 11:14). He arrives at the temple and casts out the money changers and dove sellers, saying the following. “It is written, ‘My house is a house of prayer,’ but you have made it a ‘den of thieves'” (Luke 19:46). Nipsey’s murder happened on the only day Jesus ever showed anger or violence. This was the act which turned the forces against him and led to his DEATH/SACRIFICE. As we touched upon earlier, it appears Nipsey was becoming increasingly involved in community activism. In fact, he was murdered just prior to a planned meeting with the local police Commissioner to discuss violence in his community. More interesting, however, is that Nipsey was in the middle of a project wherein he was producing a documentary discussing a curing AIDS and cancer. If you think it’s crazy that the government would kill somebody attempting to bring forth the cure to HIV or cancer just remember back to Malaysia flight MH17 which allegedly got shot down by Russian funded Ukrainian separatists over Ukraine in July of 2014. On board were at least 6 of the top world experts who were close to finding a cure for the HIV virus. On board were also at least 100 other attendees of the annual international conference on HIV research. Nipsey had this to say on The Breakfast Club radio show in LA. prior to his death. Why do they kill all holistic doctors? It’s because you’re short-stoppin‘ their grind. Why do niggers get killed for husslin‘ in front of a niggers spot? You’re short-stoppin‘ their grind. 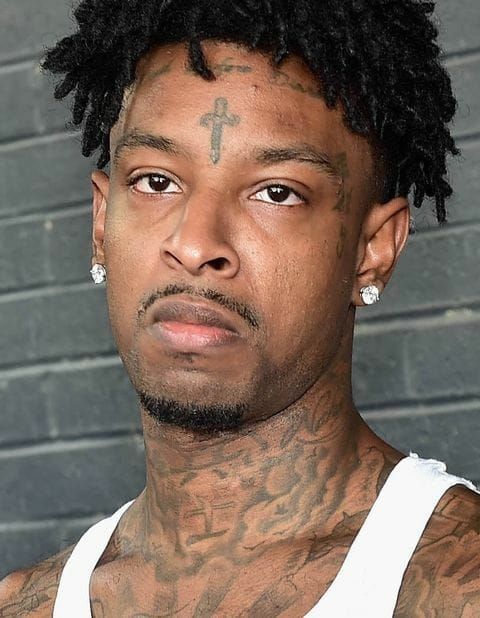 These niggas, they be checkin’ billions.You got niggas get flipped for a couple hundred thousand. So you playin’ with some pharmaceutical money……. It would seem Nipsey was cutting a little to close to the bone. It’s no secret that the black community has been its own worst enemy here in the U.S. for decades now. Their communities accepted the crack cocaine and gangster rap pedaled to them by the social conditioning corporatists who wished to see them remain slaves. They’ve adopted overall, a culture of immediate gratification which values violence, money, and ego inflating success at the expense of education and long-term relationships upon which civilizations are built. I’ve said for years that it was diet which conquered the Native Americans. If you don’t feel good and healthy you will not behave and think in a healthy manner. Native Americans, who lived primarily on lean meat and vegetable matter were conquered and given a diet of wheat, sugar, high-fat meats, and alcohol. Whether intentional or not this diet contributed primarily to their subjugation. Both its addictiveness and its negative effects upon their bodies. It would appear that Nipsey was concerned quite heavily with nutrition, Cleansing, And holistic medicine. This was no doubt due to the influence of Dr. Sebi who also died in Honduras in police custody under very suspicious circumstances. Dr. Sebi, was a pathologist, biochemist, and herbalist. He came to the U.S. from Honduras and was on a mission to heal humanity. As it happens, he had been curing some of the most deadly diseases on the planet for almost 30 years. AIDS, cancer, diabetes, lupus, and epilepsy are just a few of the ailments he has completely reversed. In fact, he is so committed to his work that he took on the Attorney General of New York in a Supreme Court trial — and won. It’s an open secret in the rap community that a large number of African-American rap artists are gay. Many of them are also positive with HIV. African-Americans are more susceptible biologically to contracting many diseases at higher rates than other races. Couple this biology with crack cocaine, fatherless homes, and hyper-sexuality and you have a recipe for enslavement. It would appear that Nipsey had discovered the root of all of the cancer within his community and was taking active steps to reverse it. This is why he was killed. What makes me more sure of this is sheer the amount of media coming out condemning “conspiracy theories” such as this. We’re being told to not buy and to these thoughts that it was simply a murder between two people who disagreed. We’re told that this HIV documentary rabbit hole is complete fiction and that we should simply honor the memory of a rap gangster. Of course, I knew I was on the right track when a few days after his death there is a movement to name a road after him. What do we know about memorials? They are energy harvesting sites. They are energetic infrastructure from which to glean emotional energy on an ongoing basis from a traumatized constituency. Memorials are nothing but slave management infrastructure. In conclusion, I believe Nipsey Hussle was not only positioned perfectly in every way from an energetic standpoint of having the ability and the means to affect real positive change in the black community. But he was poised and had the knowledge behind this vibrational foundation. Nipsey Hussle not only had the ability to lead the black community out of their social ills but he most assuredly would have. I believe all this was monitored and taken note of and when Nipsey ceased to be a gang rap corporate slave and decided to turn his social capital to curing the black community, his energy and momentum was hijacked in a ritualistic murder and redirected back into the prevailing negative energies which dominate black culture. I urge everyone out there, of all races, take note of this sorcery. Do not allow them to hijack what Nipsey hustle stood for. The work he was about to embark on, and what he would’ve most assuredly accomplished. There will always be conspiracy theories that he’s not dead. That it was in April fools based ritual. There is the video of that rather fake looking leg flapping around. But from an energetic standpoint, it doesn’t matter. Nipsey is not coming back the narrative has been scripted and the ritual was executed.